Are you trying to figure out what the most popular kitchen countertops are for your new kitchen or kitchen makeover? There are quite a few options out there. You not only have to worry about the shape, but also the materials that you use. Your kitchen may be set up for a U-shape, or even a galley style, which can make choosing the right material difficult. There are so many options, like butcher block, slate, tile, and granite kitchen countertops to choose from. Here is an overview of many different styles, and the most popular kitchen countertops to go with them. When you have a smaller kitchen space, the two most efficient kitchen setups are the galley kitchen and the one-wall kitchen. A one wall kitchen is exactly what you picture based off of the name. They are commonly found in loft spaces or in studios. Everything you need for your kitchen is on a single wall, making the most use of the space. A galley kitchen is similar, but two walls are used. It is a long, straight kitchen with workspaces on both sides, making good use of the space. These types of kitchens often have a lot of traffic moving through them from one side to the other. It can make using some more delicate kitchen countertops a bit less ideal. In situations like this, using granite kitchen countertops is a great solution. They are beautiful as well as durable, giving you a great look even if you have a small space. If you have an L-shaped kitchen, you have a secluded workspace to prepare and cook all your meals. This is the ideal setup if your kitchen is in a corner, as it maximizes what space you have to give you the most workable area. This kitchen is ideal for many of the more delicate kitchen countertop materials as there is almost no through-traffic in these kitchens. If you want, you can go with softer stones like quartz and slate. They will look gorgeous, but they cannot withstand as much banging around. Horseshoe or U-shaped kitchens are some of the most popular kitchen styles around. They often involve solid counters around three sides of a room, with an island in the middle. This allows you to put some of the most popular kitchen countertops to good use. You can set up a full chef’s kitchen in this setup, because you have room for more of the larger appliances. This gives you the ability to cook more foods on the different workstations you can set up. One of the biggest benefits of having a horseshoe or U-shaped kitchen is that you can set up multiple workstations. You can have one prep area with butcher block so that your knives stay sharp when you use them. Plus, you can add in materials like granite kitchen countertops to keep the kitchen looking classy. It is important to make sure you pick a kitchen countertop material that stands up to how you use your kitchen. If you barely use the kitchen, you have different options than if you use your kitchen regularly for large meals. Peninsula kitchens are another very popular option. They involve one of the above kitchen shapes, often horseshoe kitchens, but instead of having a floating island, the island is attached. This gives the kitchen more of a G-shape. You have a lot of versatility when looking over the most popular kitchen countertops for this type of kitchen. You have limited traffic due to the setup, so some of the more delicate materials are typically usable options. If you have a kitchen that gets heavy use, you can also go with options such as cement and granite kitchen countertops. They give your kitchen a lot of durability, plus they offer a unique, sophisticated look. You have plenty of color options, no matter which of the most popular kitchen countertops you choose. What is most important is that you consider how you use your kitchen, how busy it will be, and the look you hope to achieve. If you are not sure what materials to use, the best option you have is to ask a professional. They know what materials work best and wear out quickest based on the size and shape of your kitchen. No matter what style of kitchen you have, the type of material you choose for your countertops matter. Reach out to us here at Granite Huggers and let us help you figure out what is best for your kitchen and usage. 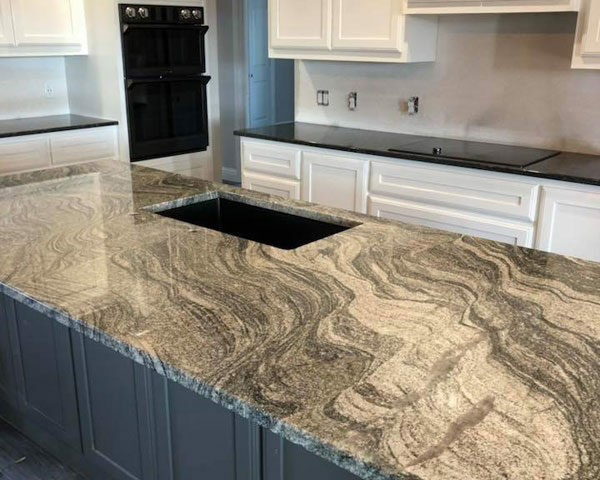 Call us at (972)670-4533 today and let us have a conversation with you about the most popular kitchen countertops for the style of kitchen you have!